B vitamins are important for your overall health.Vitamin B12 helps play a key role in metabolizing fats, carbohydrates and proteins. Folic acid helps to reduce the risk of neural tube defects when taken daily prior to becoming pregnant and during early pregnancy. 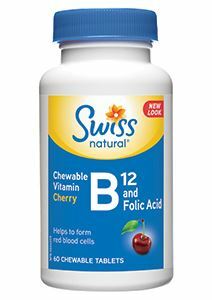 Our combination B12 and Folic Acid helps the body with the formation of red blood cells. These tablets are a combination of Vitamin B12 and Folic Acid. Each tablet contains 1000 mcg of B12 vitamin, 200 mcg of Folic acid. Available in tasty cherry flavored chewable tablets.